Can majestic, touristy Palace of Versailles be as well cosy? I didn’t think so, but it actually can. I don’t what pops into your mind when you hear Versailles, but I was thinking – majestic, showy residence of French kings with huge gardens. Just next thought was, it will be very touristy. I wasn’t wrong. There were a queue to enter, it only took us an hour. I guess it could be worse. Once you get through the security, you will find another queue. Luckily we were told this one was only for audioguides, so we have decided to skip it. And then there is another queue to buy tickets. You can skip this one as well if don’t mind using a ticket machine. Tip from a guidebook: you can also start your visit from Marie Antoinette estate, there should be less people in the palace in the afternoon. When you approach Versailles you know, it’s not some mediocre mension. The gold shines from far away. It’s the same inside. You go through countless rooms, one grander than other. They are all beautiful, but I got quite resistant to the beauty after a few rooms. I much prefer to enjoy splendour in moderation. 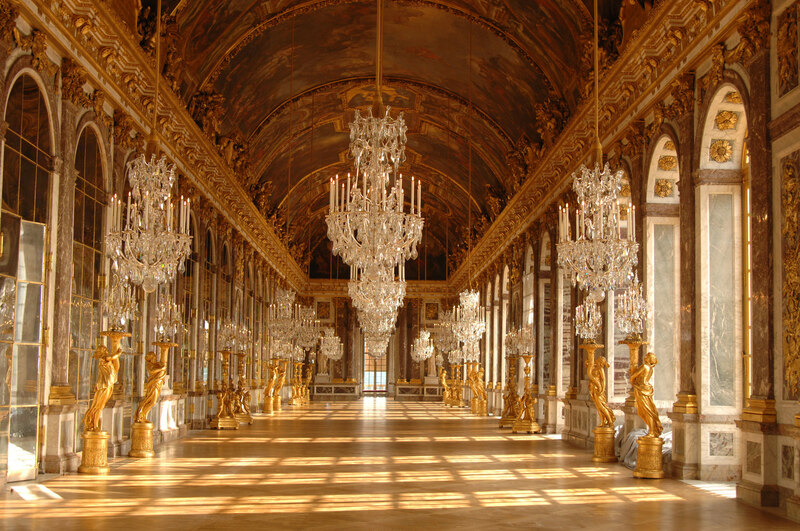 Even though I was tired of all people taking selfies and blocking the view I must admit, that The Hall of Mirrors is stunning. I would love to be able to spend 5 minutes in this room on my own. Just look at this photo. I was relieved when we finally left the chambers. Once you leave them people start to disperse and then disappear. Most of them don’t go further than the Bacchus fountain. The gardens are monumental. You can’t see the end of them. The hedgerows are so high I just wondered how did they look for a kid that got lost in there while playing hide and seek? The gardens are still monumental, you feel they were made to impress, but the greenery, water and fresh air makes it enjoyable. Five hours is not enough to explore everything. We only had a brief look over the main gardens while we were heading towards Grand Trianon. In our rush we missed beautiful Orangerie! Don’t make the same mistake! The Grand Trianon is a little bit off the beaten track. It’s not included in the basic ticket (you need to get The Passport ticket), so there is just less people. And finally once you are walking towards Marie Antoinette estate you start to feel like you were magically moved to a different fairy tale. That was definitely something I haven’t expected. You walk into a beautiful meadow. You can hear insects buzzing. You can smell wild flowers, sun is gently touching your face. It is so calm. In the distance you start to see those cutest little buildings. I haven’t seen ponies, but there were bunnies and chickens. And finally you get to a gate and you notice you are not in a palace, nor in a countryside, you are just in a city. Tickets, if you plan to visit Trianon and Palace you should buy ticket called Passport, it’s available for 1-day or 2-day. Posted in France and tagged palaces and mansions, paris, travels. Bookmark the permalink. Wow Magda, such beautiful photos and thank you for taking pictures of Marie Antoinette’s mansion, I had never seen it! She was quite fond of re-enacting scenes of pastoral imagery and played a lot making tableaux vivants with her court so I guess I shouldn’t be that surprised! You are very good Lou, I don’t even have a Paris bookguide and I just went clueless. But it totally makes sense to make tableaux vivants there! It’s totally like a girly playground for me, that’s why I wouldn’t mind living there 😉 Have a lovely weekend as well! Dziękuję bardzo Beo. Cóż może pora na powrót? Może tym razem późną wiosną albo latem?